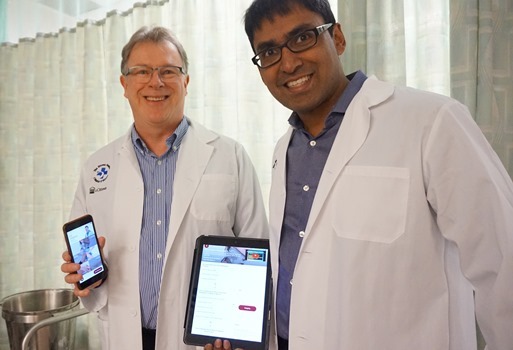 The Ottawa Rules, a set of rules used around the world to help health professionals decide when to order x-rays and CT scans, are now available as a free mobile health app. Developed by emergency department physicians at The Ottawa Hospital and the University of Ottawa, the Ottawa Rules are evidence-based decision trees that help physicians determine whether a scan is needed for injured bones, cutting down on unnecessary radiation and wait times. The existing rules for ankle, knee and spine injuries have been bundled together in a mobile app to appeal to a new generation of wired doctors, nurses and paramedics. The app includes the Ottawa Knee Rule, the Ottawa Ankle Rules and the Canadian C-spine Rule, which were previously only available as posters or online. The Ottawa Rules have been validated by more than 20 studies, translated into several languages and adopted worldwide. For example, two of Dr. Stiell’s rules made a list of the top five ways doctors in the United States can reduce unnecessary procedures, published in the prestigious journal JAMA Internal Medicine. Seeing the potential of mobile technology to put the Ottawa Rules into the hands of health-care professionals, Dr. Stiell joined forces with The Ottawa Hospital mHealth Research team led by Dr. Kumanan Wilson, a specialist in general internal medicine and senior scientist at The Ottawa Hospital and professor at the University of Ottawa. The team, which includes Cameron Bell, Julien Guerinet, Yulric Sequeira and Katherine Atkinson, also developed the popular ImmunizeCA app to help Canadians keep track of their immunizations and make informed decisions. "I think it is great how a group of creative young people can take a world-class discovery like the Ottawa Rules and make it accessible to a new generation of physicians,” said Dr. Wilson, who also holds a chair in public health innovation. "This is a great model for innovation in medical care." Studies have repeatedly shown that the Ottawa Rules reduce unnecessary imaging and emergency room wait times, which allows patients to feel more comfortable while waiting to be seen by a clinician. The Rules also lead to significant savings for hospitals. However, the creators of the Rules still face the challenge of dissemination. The team hopes the new mobile and web formats, with images of bone structures and YouTube videos, will help the Rules become more widespread in emergency departments around the world. The Ottawa Rules app can be downloaded from the Apple App store on any device compatible with iOS or the Google Play Store for Android operating systems. The app is meant for clinicians – not members of the general public. The project was funded by The Ottawa Hospital Academic Medical Organization (TOHAMO). The Ottawa Hospital has also developed rules for venous thromembolism, head injury, chronic obstructive pulmonary disease, subarachnoid hemorrhage and transient ischemic attacks. Audiovisual: Videos are available of Dr. Ian Stiell discussing the Ottawa Knee Rule, the Ottawa Ankle Rules and the Canadian C-spine Rule.